First time in the Northwoods of Wisconsin? Well, prepare to fall in love. The Northwoods of Wisconsin is home to winding rustic roads, stands of pine and tamarak, huge white pines and great places to check out while you’re exploring. Amazing all year long, the Northwoods of Wisconsin explode with brilliant color in the fall. If you want a short and sweet drive to enjoy the fall colors, Rustic Road 60 is a fantastic place to go. Rustic Road 60 is a winding 12-mile route that goes right through the heart of the Northern Highland-American Legion State Forest. If you’re staying in one of our beautiful vacation rental properties in Boulder Junction, this drive is right there! Rustic Road 60 runs from Cty. Rd. K, south of Boulder Junction, to Cty. Rd. M in Sayner/Star Lake. On your driver you’ll pass old logging camps, and old saw mill and many hiking trails. Check out Lost Canoe Lake which is a very popular fishing spot where you can catch walleye, largemouth bass and northern pike! On this route you’ll also find the turnoff for the Star Lake Nature Trail. This is a great place to pause and take a walk on the nature trail that leads to a peninsula on Start Lake surrounded by the beautiful fall trees. As you near the end of this beautiful drive, make a stop at Stillwaters in Star Lake for a bite to eat to recharge. Click HERE for a map of this short and sweet drive! If you want to try your hand at leaf peeping, but don’t want to spend all day driving, then this medium and meandering fall drive is for you. This drive is 30 miles long and goes from Presque Isle to Land O’ Lakes on County Highway B. We have beautiful vacation rental properties on either end of this drive for you to call your home base. This drive passes through some beautiful fall scenery and the best part is there aren’t many powerlines to disrupt your view. To follow this route, head out of Presque Isle on County Hwy. B, once on the road, you’ll pass the East Bay Road which is the turnoff for the Catherine Wolter Wilderness Area - - which consists of 2189 acres of forest bathed in fall color beauty. On your way to Land O’ Lakes you will pass the Subcontinental Divide; waters north of this divide run to the St. Lawrence Waterway, where waters south of this divide flow to the Mississippi Watershed. In addition, you’ll pass the Land O’ Lakes Bike trail, where you can take a ride or a nice walk with your family. If you take this route in the late afternoon or early evening, you can end your drive with dinner at the Twilight Supper Club and Sandman Lounge in Land O’ Lakes. This is a drive for leaf peeping experts. Think of it as a circle tour of Northwoods Wisconsin fall color splendor. 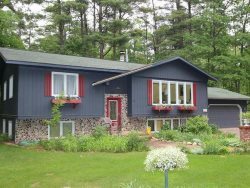 This circle tour can home base either in Manitowish Waters or in Presque Isle where we have vacation rental properties you can use as home base. Starting from Presque Isle for the circle tour, head east on County Highway B towards Land O’ Lakes, and enjoy one of the prettiest stretches of road in the Northwoods (this is also the Medium and Meandering driver). From Land O’ Lakes, hop on Hwy. 45 until you hit County Highway E, then head east on County Highway E towards Phelps. Once you get to Phelps, follow Highway 17 From Phelps, and meander southwest to North Twin Lake where you will continue south on Highway 45 South into Eagle River. Along the way you’ll see the amazing and picturesque high line pines. From there, take Highway 70 west to St. Germain. When you get to St. Germain, make sure you keep a look out for the statue of Chief St. Germain as you take Highway 155 north out of St. Germain to Sayner/Star Lake. Once you’re in Sayner / Star Lake, think about checking out Funny Farm Fisheries with the kids to catch trout you can keep! Once you’ve caught your limit in Sayner / Star Lake, go west on County Highway N until you reach County Highway M where you’ll take a right and head into Boulder Junction. Boulder Junction is a great place to take a walk on the main street and check out the unique shops. Once you’ve filled your shopping bag, head west out of Boulder Junction on County Highway K and then finally South on County Road W to Manitowish Waters. Once you get there, you can enjoy an amazing Prime Rib dinner at Anglers. Once your belly is full, head north on County Highway W back to Presque Isle for a good night’s sleep in one of vacation rental homes. Phew! That’s an amazing fall drive! !